There seems to be a lot of talk in the trade press recently about 'neuromarketing'. And there was an interesting piece 'advertising is a poison' in The Guardian last week. George Monbiot makes some good points in the article. At W+K we don't tend to think of our work as a 'battering ram' of 'pervasiveness and repetition'; the people behind the likes of Go Compare may well have a different point of view. But is advertising the cause of a society that celebrates image, power and status, or is it a symptom of this society? People have aspired to these values since they were jealous of the neanderthal with a better cave. The societies where the state has tried to enforce the suppression of these aspirations – hello, Stalin's Russia, North Korea – have in the main been pretty miserable places. It isn't just advertising that makes humans want a bigger house and a new car. Since the publication of Hidden Persuaders in the 1950s, academics have been suggesting that advertising has the power to manipulate the subconscious. But it's pretty rare that an agency team will have a conversation with clients about neurobiology, or how our message will be processed by the prefrontal cortex of our audience, or how we can conceal some sort of secret mind-control message in an ad. It's just not that scientific or simple. We wouldn't deny that advertising has the power to manipulate the unconscious mind. But pundits overestimate our ability to control or predict how we're doing it. Meanwhile, it's ironic that Monbiot suggests advertising is to blame for low savings rates by UK families when at the bottom of the article there is an ad for… Barclays Investments. In Marketing magazine this week, Dr AK Pradeep 'one of the world's leading neuromarketing experts' says, "One of my clients trying to sell milk experimented with various imagery – farms, grass, hay, barns farmers…The one that always wins out is cows. Somehow the source of a product is more evocative in the deep subconscious than anything else. This is something we've learned through neuromarketing." Our view: the difficulty with showing cows or talking about the other familiar benefits listed above by Dr Pradeep is that it gives the audience immediate permission to ignore you because they assume you're telling them what they already know. But something dissonant and unexpected like a polydactyl cat slaps you across the face (not literally, we don't yet have the technology to make that possible) and makes you pay attention in a way you wouldn't have done otherwise for such a functional product. An 8% sales increase suggests that this approach has merits. 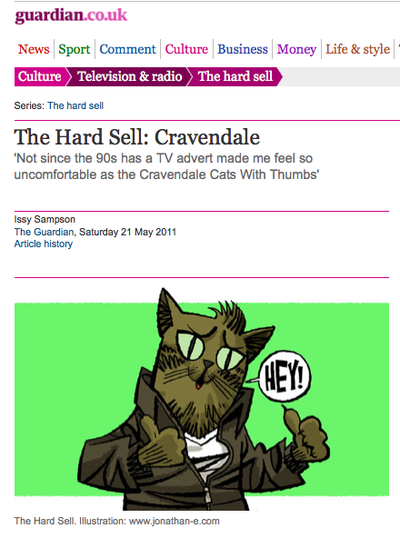 The Guardian's 'Hard Sell' takes on our Cravendale campaign. I think they like it. But I'm not sure. Traditionally, adverts are meant to make you want to buy the product they're advertising. They're supposed to be aspirational, or funny, or memorable, or just feature a long, drawn-out romance between a couple that couldn't have kept their love alive or overcome the bumps in the romance road without the help of a company that offers both telephone and internet services. But not since the 90s, when alcopop Metz introduced the dream-haunting Judderman (don't YouTube it before bed) has a TV advert made me feel so uncomfortable as the Cravendale Cats With Thumbs. The 41 seconds of terror begin deceptively quietly, when the question is posed: "Why do cats always stare when you're pouring milk"? Apparently it's because they're plotting. They know it's only a matter of time until they grow thumbs (the crunchy squelchy sound of a sprouting cat thumb will haunt you at 4.35am, when you wake up sweating and shaking as your own moggy scratches at the door). 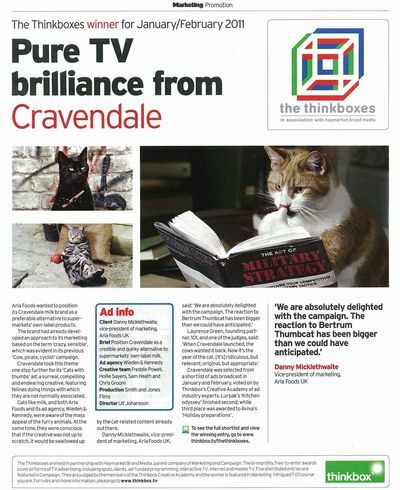 Cravendale wants us to know that when cats have opposable digits, they'll be reading books (on WAR – SIGNIFICANT!!! ), sewing, and forming 1960s West Side Story-style gangs, only with worse singing voices. Cats can already see things we can't; what makes you think forming an army to reclaim the world's milk isn't the next step? The irony, of course, is that adult cats are lactose intolerant and shouldn't drink milk. Which means that any act of war over dairy products is just spiteful. The ad closes with the futile words "Jog on, kitty." But it's no use. It's a stark warning of a worrying future when felines rule the planet and humans are left with the worst thing of all: soy milk. Friend of Cravendale – Bertrum Thumbcat – is orchestrating a 5 day event to prove the competency of thumbcats – and show the world what they are capable of. 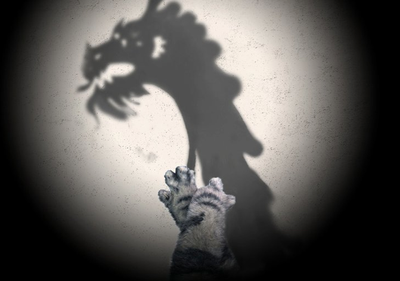 If you’re curious about what they can do, ask ‘Can a thumbcat…’ on FB and Twitter and Bertrum will endeavor to display the dazzling power and cunning tactical skills of the polydactyl uprising. Form gangs and take over the world? Well, of course. One step ahead of you there. Yup. But chess is more his thing. 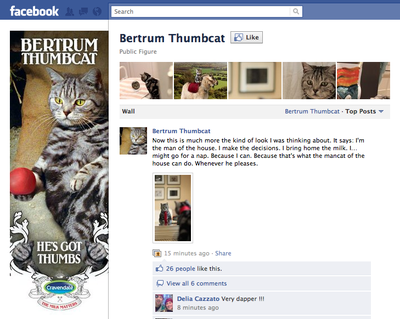 Further proof of thumbcats' superiority to follow. "I had a glorious nap (it being National Napping Day) and had glorious dreams. Dreams of great power. 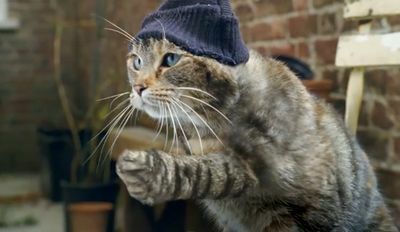 Ulf Johansson and Wieden and Kennedy London have joined forces to create Cravendale’s new integrated campaign, Cats with Thumbs. MPC worked with creatives Sam Heath, Chris Groom, Freddie Powell and Hollie Sayers to boost the kittens’ dexterity and take their acting skills to the next level! The spot brings to life a man’s mental flight of fancy as he muses on what might happen if cats were to grow opposable thumbs. The spot stars a number of polydactyl cats preparing themselves to try to get to the Cravendale milk they so love. 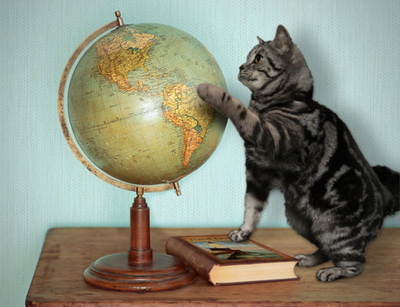 The cats perform a range of human-like tasks with their evolved thumbs – they file their claws, knit, read [The Art of Military Strategy] and click their fingers, West Side Story-style. The main challenge for this spot was not to use any CG and composite everything from live action plates. Pre-production was essential as it allowed us to plan each shot as depicted in the storyboard and gave the cat trainer precious time to get the kittens’ acting skills up to scratch. Artem built very detailed, matching paws for each of the cats featuring in the commercial which we used for some of the close-up shots. These were carefully tracked and composited into the cats' bodies. We then removed the real legs of the cats and used stills and numerous action plates of fur to marry the model paws together with the real cats. The most challenging shot was probably the one where the cats are standing on their back legs and are walking into the house. We built various versions of that shot, trying different approaches and using different plates in order to find the best takes to combine, as well as the best solutions for compositing, as it was very important to keep the real movement and shape of a cat standing and walking. To achieve this we kept away from any warping or morphing and were clever in our use of the shot plates. All the work was done in Flame and Flare with support from Nuke; head replacements, eyes, matching different takes of the cats and combining them into one seamless performance, were some of the tasks we had in order to tell the story of cats with thumbs, along with clean up and DMPs for set extensions. Jean Clement Soret did the colour grading for the spot. ‘Cats with Thumbs’ is the first piece of work in a brand new campaign from Wieden + Kennedy for Cravendale that intends to get totally carried away with everything milk-related. 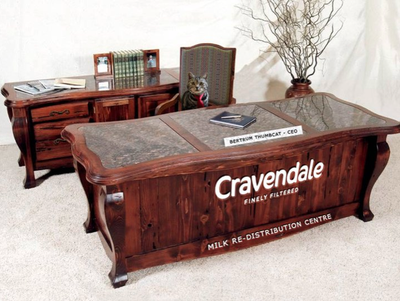 The TV ad brings to life a mental flight of fancy, musing on what might happen if cats were to grow opposable thumbs. 'Cats with Thumbs' is the first piece of work in a brand new campaign from Wieden + Kennedy (that's us) for Cravendale that intends to get totally carried away with everything milk-related. 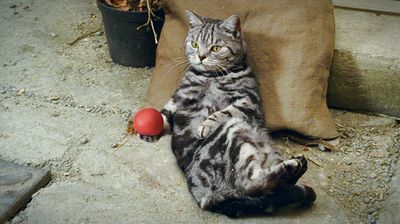 The TV ad brings to life a mental flight of fancy, musing on what might happen if cats were to grow opposable thumbs. Bertrum and his thumbed friends also feature on the revamped Cravendale website TheMilkMatters created by Outside Line. Huge thanks to everyone involved at W+K and Arla, director Ulf Johanssen (Smith & Jones Films) and MPC. It's been mental. 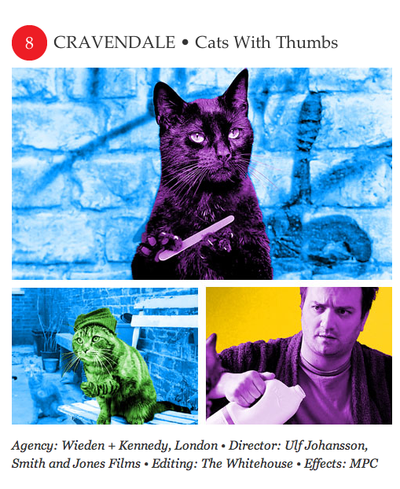 Author Wieden Kennedy LondonPosted on March 2, 2011 March 31, 2016 Categories cravendale, the workTags cats, cravendale, kennedy, thumbcats, thumbs, wieden3 Comments on Cats. With Thumbs.